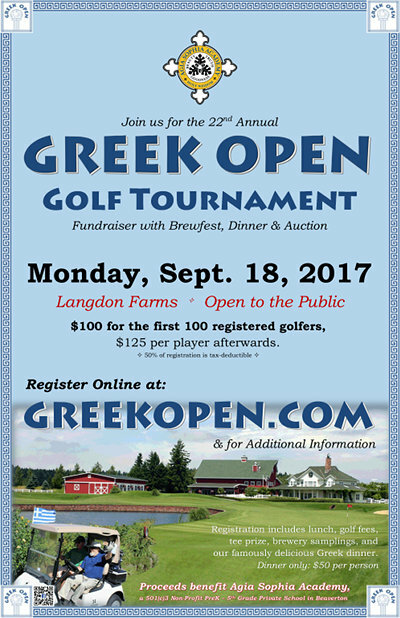 Join us on Monday, September 18th, 2017 for our 22nd Annual Greek Open Golf Tournament and Dinner Event! Open to the Public. Proceeds to benefit Agia Sophia Academy. Don’t golf? That’s ok too! Come for the Dinner & Auction and support quality Orthodox education in Portland. Please visit the website for information about location and cost and to register! This entry was posted in education, fundraisers and tagged Agia Sophia Academy, golf, greek open. Bookmark the permalink.